In his research, sociologist Andrej Holm compares processes of gentrification and housing policy worldwide. And Berlin, where he lives, is the perfect case study. Few other European cities have experienced such major changes over so short a time. Despite what he sees as gaping discrepancies between the views of local government and citizens, Holm remains surprisingly optimistic. 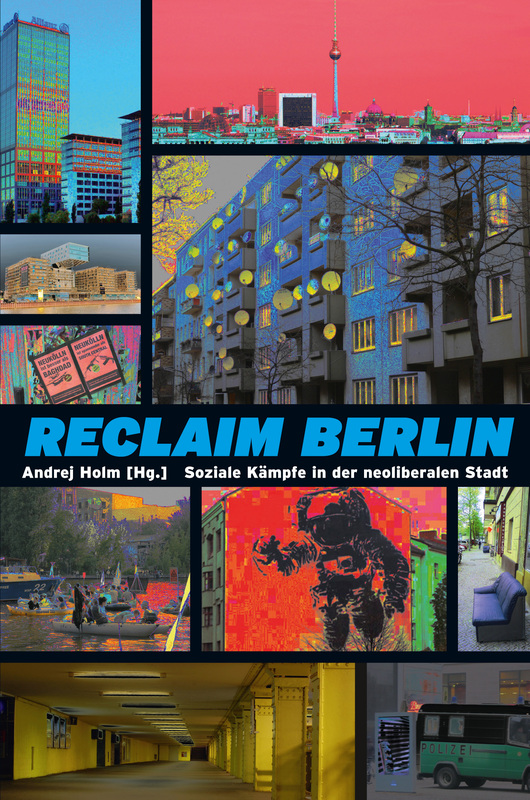 Your recent book “Reclaim Berlin” brings together essays on “social struggles in the neo-liberal city”. One might say that after German Reunification, Berlin’s superabundance of free spaces – spaces that allowed the “urban commons” to be renegotiated – provided a unique opportunity to develop a counter-model to the capitalist city: but this opportunity has been squandered. Are the current “social struggles” the last battles in a broader conflict against neo-liberal forms of urban redevelopment that was already fought and lost in the 1990s? A city is always a field of conflict and new conflicts and movements are constantly emerging. From at least the 1970s on, Berlin was always a hotly contested territory and has had a very lively, diverse culture of protest. It’s true though, that after Germany’s reunification the increasingly neo-liberal restructuring of the city brought a growing sense of disillusionment. By the end of the 1990s, the major battles really did seem to have been lost. But then, around 2005, the scene changed again and urban redevelopment was back on the agenda for many grassroots movements. The turning point came with resistance to the large-scale investment project Mediaspree, when a broad-based citizens’ movement campaigned successfully for a referendum about the huge plans of the city authorities to build new hotels and offices along the river Spree. But this initiative, too, was ultimately unsuccessful. Even the relatively large demonstrations against the demolition of parts of the East Side Gallery were largely ignored – a hotel and a luxury apartment block are currently being built on the site with more to follow. It depends what is meant by “success”. Although not withdrawn completely, the land-use and zoning plans were altered in many areas. Since reunification, Berlin has pursued an urban development policy geared primarily to the interests of investors, the narrative being investment is always good for this poor city. For many years questions of urban design have been decided bureaucratically, considering material and financial constraints, with no apparent political vision – as if working under conditions of austerity leaves no room to manoeuvre. As if one had to be grateful to any investor showing any interest in Berlin at all. So the protests did at least achieve a change in this political mindset? Precisely. The dogma of belief in investment and growth as the solution to urban problems is finally being questioned. The change is coming not from “above”, from established parties or major interest groups, but from a plethora of smaller initiatives by tenants, citizens, local residents, and users. Berlin’s urban development policy is being re-politicised “from below”, thanks in particular to high levels of public awareness. Let’s take housing policy. Before 2011, there was little serious discussion about this because of a consensus between the press and political parties that there was enough affordable accommodation. Small tenant campaigns like Kotti & Co. using high-profile protests – erecting a Turkish-style shanty dwelling or gecekondu – put the issue of municipal housing back on the political agenda. Now, discussions are taking place about the precise role of municipal housing associations – even where new accommodation needs to be built. Another factor here is the Berliner Liegenschaftsfonds, a company created in 2001 to manage all municipally owned real estate that actually has been selling off as much as possible for maximum profit. Over the years, initiatives like Stadt Neudenken (“Rethinking City”) or Haben und Brauchen (“To Have and to Need”) have prompted discussions among the city’s authorities on a new real estate policy that balances maximising profit against proposed land-use. But in practical terms, urban restructuring still seems to be following a more or less neo-liberal model. That’s true. Unfortunately, political realignment on this scale takes a long time. Projects currently being built near the East Side Gallery or on Alexanderplatz are often the result of contracts signed in the 1990s. So the new buildings can be read as a direct consequence of the investor-friendly policies of recent years? Yes, which is also why protest is on the increase. Now the consequences are becoming apparent, everyone understands what’s going on, and obviously many people don’t approve. It’s similar with gentrification. These processes are not new either. But the number of people directly affected by the mechanisms of exclusion is rising. That’s the material basis for the protests in Berlin. In a way, official government policy has always favoured the reinvention of the city, meaning new buildings – the famous “city of tomorrow”; whereas protest movements have mostly been about improving existing structures. Originally, this primacy of renovation over demolition and modernisation was not a political programme, but something practiced by 130 squats in Berlin in the 1980s. They said: “the city of tomorrow” is already here, we just need to reprogramme it. Subsequently, this practice became recast as an internationally-renowned programme of urban renewal. Are the protests against developing the former Tempelhof Airport site, currently a giant vacant space in the heart of the city, another example for this? For outsiders it might seem ridiculous for people to protest so much against such a small number of new buildings around this huge empty field. But the citizen’s campaign collected over 180,000 signatures. Which suggests more is at stake here: things have reached a symbolic level. What do we as an urban community want to do with this piece of land? How are users and local residents being involved in the planning? What is needed and what is already there – and who is authorised to make the decisions? It’s not about a few thousand apartments, but about general principles of participation, self-empowerment and transparency. This protest has to be taken seriously and it will become a test case for new forms of public participation in Berlin. The established parties still find it hard to deal with this: within a fortnight of the signatures being submitted, all parties in Berlin’s parliament declared their support for the planned development. A kind of all-party coalition against the democratically declared will of the people. So investor-friendly policies are being pursued even in the face of major protest? In this case, yes. But that also means that 180,000 signatories have no political home with any of the parties. In recent years, this gap between the political establishment and the reality of the city has been growing steadily. The protest movements operate in this gap – which is why it’s important they get the highest possible level of public exposure. Urban development concerns us all, and it’s crucial for any democratic system to have a political space where different interests can be negotiated. We seem to have reached a stage where many people are questioning neo-liberal politics in cities. These forces really do need to be brought together. Multiple niches (club culture, intermediate users, house projects) is no longer what we need. In among all the differences between the various campaigns and protests, we must find the common ground. What is it about the absence of commercial pressure in the city that so many people approve of? Could this become a model for the future? This would mean an overthrow of the principles on which urban development in Berlin has been based for decades – and not just here, of course.